Starting a few years back, the girls and I decided to take an annual Scandi trip at the beginning of December. The first year we headed to Copenhagen, last year we visited Stockholm and this year, we went to Helsinki. Upon arriving in Helsinki, we got a taxi to our Air B’n’B. This took about 40mins and cost 53 Euro, which when split four ways wasn’t bad at all. Public transport would have been a cheaper options but would have taken an hour longer, so we all agreed on getting a taxi. After checking in, we went on the hunt for some shops so that we would get some snacks and alcohol – you know, the essentials for any girlie weekend away! That evening, we found a local restaurant for dinner (having the biggest pizzas ever) and then went home to get ready for our night out. We initially stopped off at Ateljee Bar – a rooftop bar with incredible views over the city. Here, we tasted the countries famous gin cocktail which contains gin and tonic, a sprig of rosemary and some cranberries and it is honestly SO good. It does cost 15 euros (£13) however, but its definitely worth a try! We then went onto Henry’s bar where we spent the rest of the night. We’d been recommended to go here and it didn’t disappoint, although some locals we met told us we were ‘typical English’ for going there but it was FUN! On the way home, we all got some food. That’s one good thing about Helsinki – there are so many pop-up food stalls/huts everywhere that you can pick up hot food so easily on your stroll home. Two of the girls had chips and meat…which we think turned out to be Reindeer kebab (reindeer is one of the Finnish delicacies)! The next day was a struggle to get up and out due to hangovers, but fresh air is definitely the cure! We walked around 23,000 steps on this day! We went to visit the Church in a Rock which was really cool! Definitely somewhere worth seeing! When we arrived a choir was singing and it was a lovely atmosphere. We then went to find a cute cafe that one of the girls had heard about, which was next to the sea. Here, I enjoyed a cup of Gloggi (similar to mulled wine but so much better) and a cinnamon pastry. It was the cutest little set up! Following this, we headed back to the city centre to enjoy some shopping and stopped off at some Christmas markets. It was the cutest day. In the evening, we went to Loyly; a Finnish spa and enjoyed a nice sauna and dip in the Baltic Sea…even if it was 9pm, pitch black and only 5 degrees! Initially I was way too scared to dip in the sea but I did it eventually and it was so refreshing! I definitely would have regretted not doing it. I mean, it’s not everyday you can say you dipped in the Baltic Sea in the middle of the night in December, is it?! From here, we went on the hunt for a bar where we stayed until around midnight before venturing home. The next day we got up early to pack and then took a ferry to Suomenlinna; an 18th century sea fortress. When we got back to the mainland, we went in a few more shops and stopped off for more Gloggi at a little Christmas market. We were being complete tourists and tool some of the most hilarious pictures…(I think the wine in the Gloggi went to our heads a bit quickly)! The architecture is less pretty too (although still nice!) but is very similar to that of Budapest and Prague; capitals of other ex-communist countries. As with other Nordic countries, Finland is expensive too. A cider or a beer will cost you around 9 euros (approx. £7.50) and a pizza around 20 euros (approx. £18). Similarly to Stockholm, there is also an alcohol ban in place in Helsinki in order to lower the levels of binge drinking. This means that you can only purchase alcohol that is less than 5% in the supermarkets and if you want anything stronger, you can only buy it from an off-license type shop called Alko, which sells only alcohol and is open until 6pm every day apart from Sunday, when it is closed. In Alko, we found this drink called oriGINal, which is a mix of gin and grapefruit and it is life! We drank this so much – we bought it to pre-drink and then found that bars sold it on tap – winning! You must try this if you ever go! It was about 7 Euros (£5) for a pint. Not forgetting the locals are some of the nicest people you will ever meet! They are so friendly and talkative which was lovely and not something we have experienced in other Scandi cities. Oh and one last thing, it is cold! You definitely need to wrap up in all the winter warmers – even on your nights out! Hats, gloves and scarves are a must! Overall, we had the besttttt time I’m Helsinki. 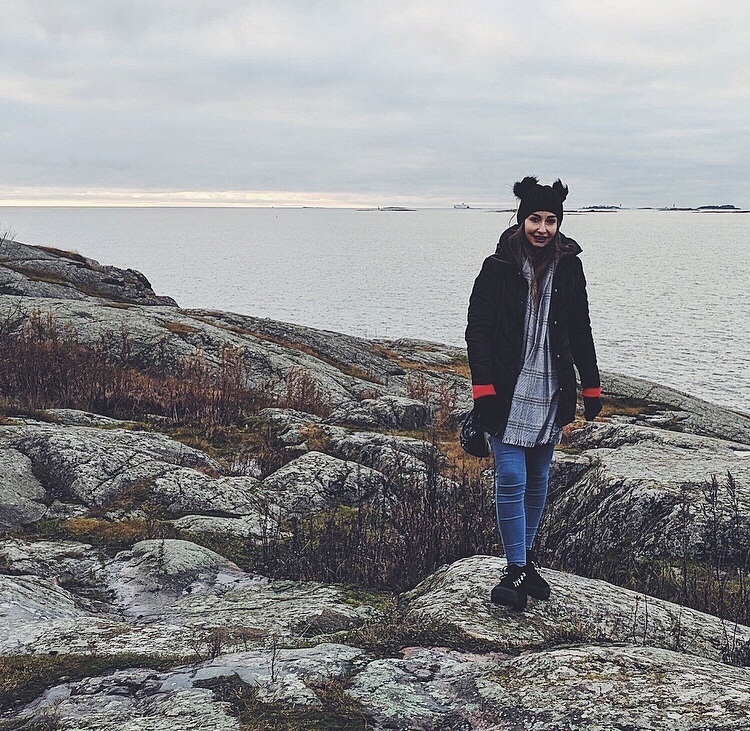 It wasn’t our favourite Scandi place but we all agreed it was probably our favourite Scandi trip, purely for the amount of LOLs we had there. It’s definitely worth a trip though, so I highly recommend you add it to your list of places to visit! You’ll love it, I’m sure!